Brady’s idea of protecting Chloe did more harm than good, Haley tried to hide out at the loft, while Diana dreamed of Marlena’s untimely death over and over again. 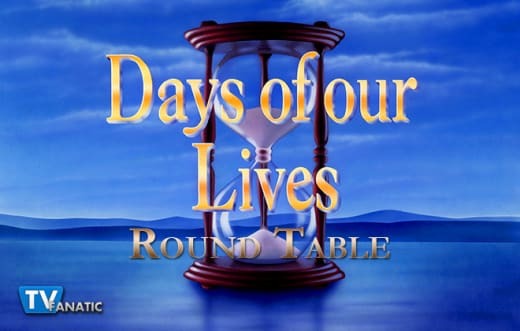 Our TV Fanatics Jack Ori and Christine Orlando are joined by Trey and Kathy from MyHourglass a Days of Our Lives fan forum to debate Stefan and Chloe’s kiss, Haley’s dilemma, Marlena’s “death,” Jack’s return, and which storylines left them cold this week in Salem. Should Chloe have gone off on Brady for trying to protect her? Trey: Yes, but maybe not so angrily. She almost killed someone or seriously hurt someone. Plus, it disrupted her business. Brady should have let her know what he was doing. I don’t think Chloe would’ve minded having a bodyguard look after her but to do it behind her back was a little insulting. Kathy: Chloe had a right to be angry with Brady. His intentions were good but he needed to let Chloe know that someone would be protecting her. He could have introduced the guard to Chloe or at least given her a description so she wouldn't be taken by surprise. Jack: Absolutely. Brady is acting like her wishes don't matter and that she needs his protection. She already has Stefan's, which she chose to have, and this is just Brady deciding he knows better than her what she needs. Besides, he didn't tell her and she almost killed the guy. And this isn't even about protecting Chloe anyway. It's about one-upping Stefan. Christine: Brady went behind Chloe’s back and made decisions for her, and in doing so he not only disrespected her, he inadvertently put lives in danger. Yes! She had every right to tell him off. I also agree with Jack that this has more to do with Stefan than with protecting Chloe. If Brady was so concerned about Chloe, he would have fought Victor much harder about Chloe moving into the mansion. What did you think of Chloe and Stefan’s kiss? Did you feel they had chemistry or no? Trey: I think they have great chemistry but feel the circumstances were a little silly. I think that they have the potential to be a cute couple. He wants a family and a home and she wants stability and I think they could be good for each other. Kathy: There is some chemistry between Chloe and Stefan but the kiss test was strange. It seemed like something teenagers would do. Jack: I hate this trope of a guy just diving in for a kiss on a woman who isn't expecting it. It's not romantic in the slightest -- as advice columnist Amy Dickinson pointed out in a recent column, it's a form of sexual assault despite movies and TV constantly asserting otherwise. Whatever chemistry they had was ruined by that. The conversation about where they were going should have come first and kissing should only happen when both parties are open to it. Christine: I was disappointed. They’ve had great chemistry when playing chess but the kiss felt entirely wrong. It’s too rushed and felt like Stefan was taking advantage of Chloe’s situation. I’d much prefer Stefan acting like a gentleman while Chloe is under his roof and for romance to come about more naturally for both of them. What should Haley do right now to protect herself? Trey: Move out of Salem! Seriously, everyone seems to have an agenda for her. I think that Haley is in a tough spot and she should move and adopt a new identity in Chicago or somewhere else. Kathy: Haley should follow JJ's suggestion and hire a lawyer, preferably an immigration lawyer. Jack: She needs to stop whining about JJ "betraying" her and call a lawyer like he's suggested several times. It's common sense that when you're in legal trouble you turn to a lawyer rather than hiding in someone's bedroom and crying that you might get caught. Christine: Get an attorney, asap! JJ has offered to help her get one, so why not take him up on it? She can either fight this thing through the courts or she has to go on the run. She’s a sitting duck trying to lay low at the loft, even if Claire wasn’t out to get her. Which possible Marlena death scenario was the most entertaining? Trey: They were all pretty funny, but I thought the strawberries comment was the funniest because of John and Marlena’s history with strawberries. Kathy: The strawberry scenario was the best. It reminds me of Marlena killing Alice by forcing her to eat doughnuts. Jack: Meh. I didn't find these daydreams funny in the slightest, though I did like the nod to John and Marlena's history with Marlena choking on a strawberry. Christine: At first I thought it was silly, but when John said Marlena choked on a strawberry I laughed out loud. I’ve lost count of how many strawberries and whipped cream scenes John and Marlena have shared over the years. Also, Diana asking if Marlena was really on the plane that crashed this time was pretty funny too. Is Jack’s return thus far a hit or a miss? Trey: Both?! I like Jack being old Jack, the politician. But I hate seeing Jennifer continue to lecture him. I wish that the writers would elaborate more on the angst for Brady and Eve with this whole storyline, and her love affair with even Jack. Or give the viewers a hint that Jack remembers something about his past. Kathy: Jack's return is a hit for me. I like the fact that he has no memories and has to rebuild a life. I may not like the direction he is taking now but I'm sure the old Jack will resurface. He has to learn the same lessons all over. Jack: Both. Matthew Ashford adds energy and charm to the canvas and I enjoy seeing him. But I'm disappointed that they went the route of Jack's amnesia turning him into an idiot who is easily brainwashed by Eve and I don't like him being molded into a villain. Christine: Both. I’ve always loved Jack and Matthew Ashford has wonderful chemistry with many of the other actors, but I hate this political story they have him in where he sides with bigoted residents who are driven by fear, selfishness, or racism. It’s draining to watch. Which storyline do you care the least about right now? Is there a story you didn’t think you’d enjoy but you are? Trey: I’m really not enjoying Leo, Sonny, and Will. At this point, I could care less. I didn’t expect to like Stephan/Chloe/Gabi. Some nice sparks were flying between Stephan and Gabi. Kathy: I don't really care about the Rex/Sarah/Eric storyline. They are adults in their 30s or 40s but they are acting like children. I'm surprised that I am enjoying the Marlena/John/Leo/Diana story. I like the devious Diana as played by Judith Chapman. Jack: I care the least about Rex/Sarah/Eric. No one is rootable in this and I don't enjoy 30-somethings acting like teenagers. I'm surprised that I am enjoying Ben/Ciara as much as I am. I don't like that Ben's killing three women was framed as an issue that can be resolved with some pills and an apology tour but I'm surprisingly sympathetic towards this couple despite some bad writing at times. Christine: Rex/Sarah/Eric. I don’t care about this triangle at all for the reasons stated above. And anything to do with Hope and Rafe as a couple is beyond boring. Also, Sonny and Will desperately trying to get rid of Leo is tiresome because Sonny and Will come across as whiny and entitled which makes them difficult to root for. Oddly enough, I’m enjoying Leo/Diana/John/Marlena. I’m actually rooting for Leo to be John’s son because I’d love to see how Leo reacts long term to someone being in his corner. Also, much like Xander, even when Leo is being despicable, he’s always entertaining. Trey: I enjoyed watching the “Marlena is dead” scenes between Diana and John. You can tell they were having fun and not taking themselves too seriously. Kathy: I enjoyed Diana's daydreams about John's reactions to Marlena's death. It gave Drake Hogestyn something new to do. I also enjoyed the Maggie sighting and her talk with Sarah. Jack: I liked Jennifer's latest plea to try to get through to Jack, though I think at this point she should give up. Christine: Chloe being formidable and defending herself, even if the guy with the gun was there to protect her. I was thrilled that she didn’t act like some damsel in distress. Want to chat more about Salem’s “Eternal Damsel in Distress”? 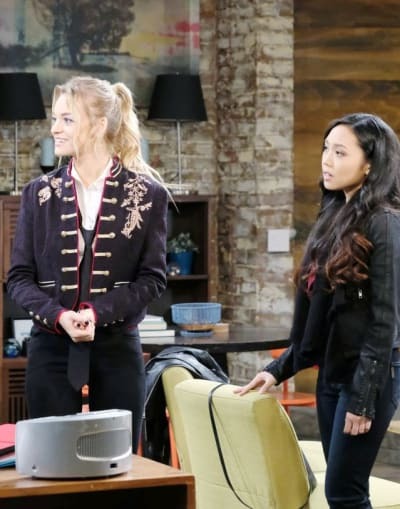 Then check out Jack Ori’s weekly Days of Our Lives review here at TV Fanatic.